A quiet weekend in European racing allows attention to switch to the other side of the Atlantic – where no fewer than four open-wheel series all have their final races. The IndyCar, Atlantic and Star Mazda championships will all be settled over the next three days, with Indy Lights also finishing its season. Britons Dario Franchitti and Adam Christodoulou are still very much in the hunt for titles, while Alex Lloyd is making his come-back and Switzerland’s Simona de Silvestro has a chance to make history. Here’s our guide to the weekend’s action. Scotland’s Dario Franchitti is one of three drivers who will be shooting for the championship in a near-winner takes all final race. The 2007 champion currently sits second in the title hunt, five points behind his Target Chip Ganassi Racing team-mate Scott Dixon and three ahead of Team Penske rival Ryan Briscoe. Either Ganassi driver can take the title by winning the race, Briscoe needs to win and get one of the bonus points for pole or for leading most laps to guarantee victory. 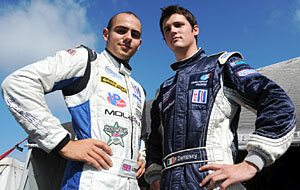 “I think all three of us are fairly confident,” said Franchitti. “We’ve had a good season. It’s just whoever does the best on Saturday night and gets a little bit of luck as well. It’s what we race for. Franchitti famously won his title in the season’s final race as Dixon, leading by a nose, ran out of fuel on the final corner – the Scot, who was then with Andretti Green Racing, was also running on fumes but had just enough to reach the line at full speed. With Franchitti in NASCAR for 2008 Dixon fought another title battle that went to the final race, this time winning the championship at the expense of Helio Castroneves. Alex Lloyd’s run in this year’s Indianapolis 500 might have been ruined by being called into the pitlane to fix a rear light at the start of the race, sending him a lap down on the leaders through no fault of his own, but it was memorable nonetheless. 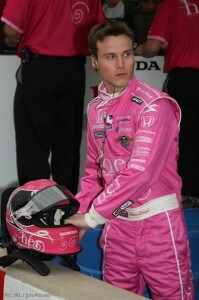 The bright pink car, firesuit and helmet that went with his HER energy drink sponsorship ensured that nobody failed to spot the one-race deal struck to put the 2007 Indy Pro champion in the race – and his impressive qualification performance ensured they had something worth watching. Since then Lloyd has quit his development deal with Ganassi in search of a full-time ride, and hopes this one-off appearance for Newman/Haas/Lanigan will lead to more next year. HER is with him again at Homestead-Miami, although the car is somewhat less pink than it was – perhaps toned down to avoid taking attention away from Sarah Fisher’s similarly-coloured breast cancer research car. The popular Fisher is steadily making the transition from driver to team owner, looking ahead to the day when she hangs up her racing gloves for good – and her cause was helped no end during the summer when a sponsor donated a second Dallara race chassis. Rather than leave one car in the garage as a spare, she is due to announce today that her team will run two cars at selected races next year – and it seems that the driver will be Britain’s Jay Howard. 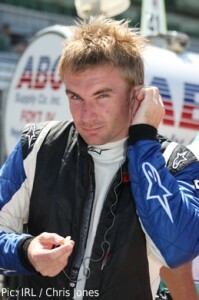 Howard, the 2006 Indy Pro champion, suffered through a disjointed and disrupted 2008 season in the IRL with Marty Roth’s struggling team and has made occasional appearances this year in Indy Lights, the re-named Pro series, including a fourth-place finish at Indianapolis. Reports today ahead of the official announcement suggest that Howard will run at the Mid-Ohio road circuit, the ovals at Texas and Chicagoland, and in the Indianpolis 500 for Fisher’s team. The title has already been won by JR Hildebrand, but today’s race offers a final chance for Panther Racing’s British duo Pippa Mann and Martin Plowman to fulfil the promise their team showed when they ran so fast in pre-season testing at this track. Panther was one of the front-runners last year with Surrey’s Dillon Battistini, but has struggled to field competitive cars this year, either in Indy Lights or in the main series with Dan Wheldon at the wheel. Plowman has generally had the advantage over the perennially unlucky Mann during the season, scoring a pair of top five finishes while his team-mate has suffered a series of disasters ranging from sudden hospitalisation to running upside down at full speed in a flipped car. 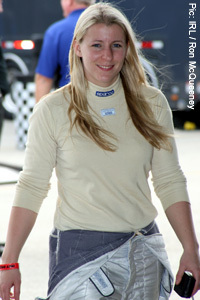 But Mann looks to be the better tuned into the demands of the 1.5 mile Homestead oval, placing third in pre-race practice in a car that she believes still has more speed in it. She said: “Homestead was the very first oval I ran on, and is still my favorite oval I have run on other than Indy. We ran very well there at the test at the start of the year. We have a fast car in clean air there, but what I now understand about oval racing is I will need to try and find a good car for running traffic and passing before we get into the race. Not sports cars at all despite the race name, the Atlantics have fallen on hard times since their heyday as one of the biggest non-Indy US open wheel series. But this year’s season finale will settle a thrilling and intriguing title battle. 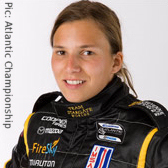 Switzerland’s Simona de Silvestro is nursing a shrinking championship lead as she seeks to become – with all due respect to 2009 Ginetta Juniors champion Sarah Moore – the first woman to win a major mixed-gender racing series. USF1 hopeful Jonathan Summerton is breathing down her neck, having won three of the last four races, and his team-mate John Edwards is only three points behind him. British interest comes further down the field in the shape of reigning Australian F3 champion James Winslow, who has produced a steady set of results despite struggling for a stable drive early in the season. Greg Mansell also took part in the last race at Road Atlanta. Another championship decider this weekend, and it’s a battle between England and Ireland as Adam Christodoulou attempts to overturn a 15-point defecit in the standings to Dublin’s Peter Dempsey. The “Irish Steamroller”, whose funding is so knife-edge that he can often only practice if rival teams will donate tyres, has won five of the season’s 12 races. Christodoulou has two victories – and so does Milton Keynes’ Richard Kent, who won this race last year and led the pair of them in the first test session but is too far back to win the title. Categorised under Atlantic Championship, Firestone Indy Lights, IndyCar Series, Star Mazda Championship, tagged under Adam Christodoulou, Alex Lloyd, Atlantic Championship, Dario Franchitti, Firestone Indy Lights, IndyCar Series, James Winslow, Jay Howard, Martin Plowman, Peter Demspey, Pippa Mann, Richard Kent, Ryan Briscoe, Scott Dixon, Simona De Silvestro, Star Mazda Championship.